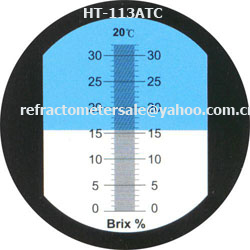 Brix refractometers are very commonly used for low, middle and high resolution Brix concentration. The low range can be used for high-precision measurement such as fruit juice, tomato juice, cola, and most kinds of beverage. The middle range can be used for concentrated of industry fluids. The high range is suited for use with food products of high sugar content such as liquid sugar, honey, etc. and accurate way to test the ratio and concentration in water .